Kathrine Virginia "Kathy" Switzer (born January 5, 1947, in Amberg, Germany) is an American marathon runner. In 1967, she was the first woman to run in the Boston Marathon as runner #261. During the race, a race official tried to stop her and take her number away. Switzer's boyfriend Thomas Miller pushed the official to the ground. Switzer finished the race. 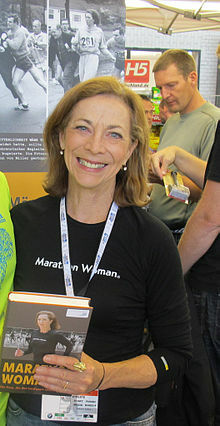 In 2017, Switzer ran in the Boston marathon again as number 261 on the 50th anniversary of her first run. ↑ Milde, Horst (June 2, 2010). "Kathrine Switzer and Roger Robinson visit the Berlin Sports Museum". German Road Races e.V. Archived from the original on March 8, 2014. Retrieved March 19, 2013. ↑ "B.A.A. Marathon 2017: Entry List". This page was last changed on 12 February 2019, at 08:44.